What follows is a modified version of a comment I appended under an insightful article on the financial plight of Greece by Ovi’s editor Thanos Kalamidas a few days ago. I have titled it A Tale of Two Unions because in effect it is an historical narrative of two polities with common features and a common moral lesson worth pondering. In the 18th century, somewhere on the North American continent a union was formed by 13 English colonies who had declared independence from the mother country and sealed it in blood by war. A new nation on a new continent was born which called itself the United States of America. In 1787 a Constitution was drafted and signed. Via that constitution the new nation had established a national government and fundamental laws, and guaranteed certain basic rights for its citizens. 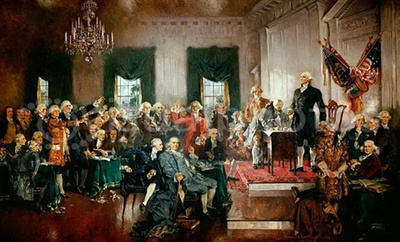 The constitution provided for three branches–executive, legislative and judicial–along with a system of checks and balances to ensure no single branch would have too much power. It was in short a political confederacy predicated on democratic ideals of liberty and solidarity and a fair division and balance of power; a sort of one for all and all for one. There was and continues to be a fair amount of distribution of wealth and contingency financial help in times of natural disasters. E.g., even today, 5% of the gross budget of the prosperous state of Connecticut goes to the coffers of the Federal Government to help poor States like Mississippi, you get the picture. But there was a problem, a sort of snake in the beautiful garden, and it was this: while the Declaration of Independence and the Constitution spoke of egalitarian democratic principles respecting the dignity of all citizens there were some states in the union which wished to ignore those ideals for pragmatic economic interests considered more important and relevant for the union. To protect those economic interestsThey decided that those ideals of solidarity did not apply to one third of the population, their African-American slaves. Even some of the founding fathers such as Washington and Jefferson did not provide a good example in this regard by keeping their slaves, for personal economic reasons. So there ensued an obvious dichotomy between the splendid political theory written on paper and the day to day social and democratic practices of the new nation; which is to say, the economy ended up trumpeting the solidarity and the ideals expressed in the constitution, and so the foundations of “a more perfect union” and its vision began to erode till some 80 years later the house almost collapsed via a civil war which took the lives of half a million combatants. That was an exorbitant price to pay for selfish short term economic interests, for an original disagreement which was kicked down the road but could have been easily settled by honoring the ideals as spelled out in the constitution. 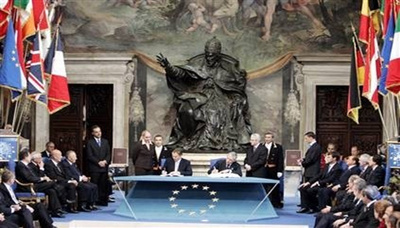 Another union was created on the European continent in the 20th century, some sixty years ago. It too was predicated on democratic ideals of solidarity. It is called the European Union. It began as a merely economic union but eventually became a political cultural entity, a sort of confederacy of one for all and all for one as exemplified by the original union of the American British colonies. The union grew by leaps and bounds and membership in it enticed many European countries. It grew fast to arrive at 27 participating States by the end of the century. As in a confederacy the States (or nations) kept their internal sovereignty while belonging to a greater union called EU. There was no common language to be sure but there was, at least for some, a common currency and a common culture. The common currency as adopted by the eurozone as a portent of future prosperity was found especially attractive. The assumption was that it would be governed by principles of solidarity and distributive justice. The whole union belonged to NATO, a defense agreement with that other union across the Atlantic which had by now become the most powerful super-power on earth. Under the Marshall Plan which was set up after World War II to help the devastated countries of Europe, especially Germany which had provoked the war, and with the protection of the US nuclear umbrella during the Cold War that ensued World War II, the union prospered and became for a short while a beacon of democracy and freedom and solidarity for the rest of the world. But it seems that the original lesson of the original 13 US colonies had been all but forgotten, for here too there was a snake in the garden and this garden was situated in Greece, one of the States of the union where Democracy had been born and that could have provided at least part of the cultural glue for the whole union. When this tiny country of some 11 million people found itself in financial troubles however, far from receiving solidarity, it was rescued with questionable shark loans by the EU bankers at exorbitant interest rates. It had failed its first test just as had happened in the union across the Atlantic when it failed the first test of declaring that all men are created equal. In this case too practical economic considerations trumped the political solidarity expressed on paper. The bankers of the union such as the IMF or the EUCB kept demanding, and are still demanding repayment of a debt which they know full well can never be repaid. Solutions such as the Marshall Plan by which Germany had been generously helped and restored to financial health in the late forties were not even contemplated, never mind implemented. That too had been forgotten. Generosity and magnanimity were simply trumped by financial greed. The lessons to be learned by the tragic experience of a civil war by that other union across the Atlantic had been all but forgotten by a State (Germany) who once again financially and politically dominates the whole European continent. Now, let the reader fill in the dots of this tale keeping in mind the parallels between these two unions. That should not be too hard to imagine. The common moral of the tale of two unions is that in a union founded on ideals on paper which are then forgotten and disrespected in practice, will not last very long. That too should not be very hard to imagine, given the resulting hard lesson of the American civil war. Now, we may call this tale a rant, or we may call it a prophecy, a warning of terrible things still to come unless a turn around occurs. History will eventually tell us which is it. As things stand now, I for one would not bet on the former. You describe the loans made to Greece as "shark" loans. To be specific, what were the interest rates on these loans? Fundamentally, I agree with you. The Eurocrats have not gone half-way or even part-way to meet the Greeks. But some blame attaches to the Greeks, too. There have long been spendthrift elements to their to their public finances. You cannot allow people to retire early and then spend decades paying their retirements without eventually running into trouble. Also their whole economy may be too "dirigiste" and in that way curiously similar to that of the French. Have you ever wondered why the French are not as rich a nation as the Germans, as they ought to be? Excessive state "dirigisisme" is part of the answer, though only part of it. Hope you are well and your family also. Are you going to Italy with another student group this summer? “On 1 May 2010, the Greek government announced a series of austerity measures to persuade Germany, the last remaining holdout, to sign on to a larger EU/IMF loan package. The next day the euro-zone countries and the International Monetary Fund agreed to a three-year €110 billion loan (see below) retaining relatively high interest rates of 5.5%, conditional on the implementation of austerity measures. Credit rating agencies immediately downgraded Greek governmental bonds to an even lower junk status. To claim ideals of solidarity and charge "relatively exorbitant interests rates," seems to me to be a bit incoherent, to say the least, which was the point of the whole article, which was never to absolve the Greeks of all blame. Your point James is well taken. It takes two to tango. No, I am not taking students to Italy this year. I am involved in the baptizing a new grandchild and moving from Broward County to Palm Beach which is nearer to my children and grandchildren. All the best to both of you. When countries lend money they don’t take them from a big safe they have in a secret place, most of the time they have to borrow so they can lend. Now when you are in a union where solidarity is a fundamental principal and your allies/partners borrow with interests that vary from -0.3% (Germany) to 0.5% (Finland – Holland) and they lend you with interests that vary from 5.5% to 8% then yes we are talking about loan sharks, actually the fact that they are your partners and allies make it even worst. Greece has a problem with collecting taxes but who hasn’t in Europe. Actually this is an easy thing to say among all prejudice that Greece has to deal with lately. The British chancellor, George Osborne while announcing new economic measures in the parliament last week, said that one of the aims for the new government is to be more efficient with taxes collecting. And the problem is common to Belgium, Austria, Italy, Spain, Ireland even Germany. the only countries that you might say are successful are the Scandinavian countries. Is 5.5 % an exorbitant rate of interest? Is it true that the Greek government has been extremely lax in collecting taxes? Why compare a country needing funds in the throes of war devastation with a country that doles out early pensions, and gives to their patrons the impression that they (the Greeks) are "blood sucking" parasites. A Dutch acquaintance recently told me that she's weary of having about 100 Euros per month taken from her hard earned salary in order to subsidize the irresponsible Greeks. Am I mistaken in thinking that 5.5% is not a "shark loan?" It strikes me as exaggerated to call such an interest rate exorbitant. Gerard, I think Thanos has already supplied an answer to your question. I also attach the link to a previously posted article where an eminent economist (Nobel Prize winner), Paul Krugman, tackles this thorny problem of loans for solidarity and loans for business. I have always found it interesting that for a long time in the ancient world debts were simply cancelled when everybody concerned understood that they could never be repaid. It took the imperialist Romans with their maxis "pacta servanda sunt" to reduce people who could not repay their debts to slavery. I am afraid that the present EU bankers are in that kind of nefarious tradition when it comes to the repayment of debts. Carmen Reinhart is a distinguished professor at the Kennedy School of Government at Harvard University and is considered the world’s foremost expert on sovereign debt crises. She has asserted recently that the general lesson that should have been learned historically on the nature of debt is that crises and economies improve only after the debt is cut and/or forgiven. On the current situation in Greece she said recently that: “I’ve seen this movie so many times before, it is very easy to get hung up on the idiosyncrasies of each individual situation and miss the recurring pattern." Indeed, one would have expected the Germans to remember that economic lesson, since their own considerable debt in 1953 was cut in half by the Allies at a London conference and one of the creditor nations, which agreed and signed on to the debt relief for Germany was none other than Greece. How does the saying go? What goes around eventually comes around. One final thought in the form of a metaphor from religious discourse: what is happening in the EU vis a vis Greece is the equivalent of the money changers in the temple of democracy. "shyster fascist Germans." The conclusion, as stated above, is an example of an informal fallacy; namely, ad hominem abusive. The context of the reduction of the German loan by the allies took place under different conditions, and in a different context. The allies at that time were facing the possibility of an invasion of West Germany by East German "Vopos," to be backed up by twenty divisions of the Red Army, similar to the North Korean Army that had invaded South Korea in June of 195o, an incursion which was not halted until July 27, 1953. At the time of the loan reduction (Read this as a reduction in some ways of war reparations), the allies had decided that they needed more than German rocket scientists to defend Europe including the Greeks from a Communist takeover. They decided to forget the Morgenthau Plan altogether, and to revive the economy of West Germany. As for lower interest rates for Finland, the Scandanavian Countries, and the other countries mentioned, there is no evidence that those countries whose economies are solvent need the loans at all. Actually Gerard you are wrong, Holland has one of the highest debts in Europe and Finland is in front of a disaster for the simple reason that the last seven years have been manipulating stats and use accounting tricks so they show a false picture to EU and the bank rating industry. A clarification if I may: neither Professors Krugman and Reinhart, nor Thanos Kalamidas, nor I have brought up the issue of past acknowledgement of guilt by the Germans for crimes against humanity and the Holocaust, that was done by Mr. Paul Gomez who brought in the term "shyster fascist Germans." Indeed, argumenta ad hominem are not only odious but are not very productive in any kind of serious dialogue, that is unfortunately the current sad spectacle that we are witnessing as staged by several Republican presidential candidates vying with each other as who will say the most outrageous enormities and insults. When an argument descends to the level of name calling, what you have is a diatribe or worse. Fellini would exclaim: bring in the clowns. I for one resent the implication that like Mr. Gomes we have been proposing an argumentum at hominem; that is like being associated with the likes of Mr. Trump and Mr. Cruz and Mr. Huckabee… In any case, Professors Krugman and Reinhart who are authorities on economics and sovereign debt have made some relevant observations which unfortunately have so far been ignored in this discussion. I still happen to think they deserve a modicum of attention and considerations by all concerned in this discussion. It also occurs to me that the logic of the bankers and the capitalistic entrepreneurs is fallacious and even unethical when they say that if you don't need a loan we will give you one with very low interest rates, but if you desperately need one we will charge you interest rates that are five or six times higher than the man who doesn't need it. To claim ideals of solidarity and charge "relatively exorbitant interests rates," "seems to me to be a bit incoherent, to say the least, which was the point of the whole article, which was never to absolve the Greeks of all blame." I understand that those who have lived with a gambling addict, or a compulsive overspender and underearner one day realize that they've been pouring their "loan money" into a bucket with a hole at its bottom. Carmen Reinhart is a distinguished professor at the Kennedy School of Government at Harvard University and is considered the world’s foremost expert on sovereign debt crises. She has asserted recently that the general lesson that "should have been learned historically on the nature of debt is that crises and economies improve only after the debt is cut and/or forgiven." The statement could be a quotation from John Maynard Keynes. The government may borrow, borrow, and borrow, and then blihtely cancel the debt. The trouble with it is that it does not work. Sooner or later, the piper must be paid. Keynes was asked once, "What about the long run?" His reply: "In the long run we're dead. "It reminds me of King Louis' "Aprez moi, le deluge," or of another such remark attributed to Marie Antoinette: "If they don't have bread, let them eat cake." Perhaps, Gerard; no doubt being fiscally responsible for individuals and nations is crucial, and the piper has to be paid and the chickens come how to roost, and becoming an enabler to gambler is misguided, I get all that but I still think that "pacta servanda sunt" by the Romans with the insistence on the punishment of slavery for life, to repay the debt rather than granting a second chance, was not a step forward but a step backward both politically and ethically. In 1953 being Keneysian was ok with the Germans and the Greeks too; now it is not but, as mentioned, Stalin then, and Putin now are waiting with open arms to become the new enabler. Perhaps the geo-political lesson of the 1953 debt forgiveness to Germany is still relevant today? Another observation: it seems preferable and more fair to me that the EU bankers running the show there, would say "the bucket has a hole and we will not fill it any longer" than continue to fill it charging five times the interest rates charged to other recipients who also have buckets with holes in them. The current move by the EU bankers is an intervention, not an enabling of decadent habits. Stringent requirements for making the Greeks get their house in order have been attached to the current loan. Germany is still imposing such conditions on those states in Germany (Sachsen, Sachsen Anhalt, Thuringia, etc.) which were brought to near ruin when they constituted the GDR. They mouthed "From each according to his ability, and to each according to his need," but did not believe at all in that other left wing slogan, "He who does not work, does not eat." Indeed Gerard, considering that a quite a few EU countries have had to undergo some kind of economic “intervention” and, rich or poor, have some kind of sovereign debt, as Thanos has already explained to us, Greece is just the most acute case. It logically follows that decadent habits are quite common even among the relatively rich countries of the EU; it is just that their severity varies from country to country. It seems to me also logical that, the business of bankers being the business of making money out of money, stop, the most grievous cases that violate Aristotelian ethical virtue theory, by their sheer profligacy and decadence and laziness, be made an example to the others, especially those others with leftist communistic tendencies, and be meted out the highest interest rates as punishment to deter them from further decadence and corruption, or sheer laziness, as the case may be. To continue with this bizarre economic economic logic: it is also quite logical on the part of the same bankers that the highest punishment be meted out to the most lazy or decadent, or those who refuse to work or take a job and egregiously produce unemployment, such as the thousand upon thousands of refugees invading Greece and Italy which the other countries, pledged to solidarity, refuse to take in; and that the ultimate punishment is starvation: as per mentioned slogan “you don’t work you don’t eat”; after all these people, as our Mexican illegal immigrants, at least according to our well informed Donald Trump who is on top of the Republican polls, are mostly rapists and murderers and they are in the EU to just get welfare, not to work. It is all a matter emphasis I suppose: do we put the emphasis on business and punishment and purely economic success, or should a more humane approach dictate that the emphasis be placed on solidarity and mutual aid as it was done in 1953 in regard to Germany’s economic difficulties, at the very beginning of the EU? Furthermore, considering that half of the world is economically destitute and malnourished it appears that capitalist bankers have not been particularly successful in alleviating the problem with their their "compassionate" interventions, for those intervention have not alleviated the problem of hunger and starvation, unless that is, it is seen as a solution rather than a problem. Herbert Spencer and Ayn Rand who were social Darwinists would surely advise us not to become misguided enablers and mercifully allow those people who are pretty useless to bankers and business entrepreneurs to simply starve to death. The economic world is better off without them going to Las Vegas to gamble away our money. The ancient Romans too, at the height of their final imperialistic decadence would enthusiastically approve too: “pacta servanda sunt” or you end up a slave to your debt for the rest of your life. We know what happened to that union, the Roman Empire, so called. It went the way of most empires who start as virtuous republics and become corrupt and decadent and eventually perish, even when they last a thousand years. Aristotle, who was a Greek as we all know, may still have something to teach us, the 50% of the world who has globalized poverty and goes to bed with a full stomach: the only authentically fit are those able to integrate body, intellect and spirit; they are the virtuous; they are the only ones who ultimately survive because their humanity has also survived a callous and savage capitalism uninterested in the common good; and that is true for individuals as well as collectives such as nations or even empires. One more observation on a potential asset of Ovi magazine that unfortunately remains underutilized. I mean the comment section under each and every posted piece. Other magazines and think-tanks, while remaining influential (such as “Modern Diplomacy” for example) do not have such a feature leading to interesting discussions and as such are missing something vital to every magazine of opinions. I notice that there are a total of 23 comments under this section, which may indicate two things: either the issue has been discussed to death, or rather, that it remains a complex issues and as such needs a genuine dialogue. If we were satisfied with the misguided slogan “each is entitled to one’s opinion” and leave it at that, we would not need dialogues and conversations. Indeed, as the ancient Greeks have well taught us, even a dialogue written by one author (such as Plato, for example) becomes more imaginative and true to existential life when rendered not as a learned essay but as a conversation between two interlocutors attempting to get to the truth of the issue at hand. Aristotle called it the will to truth which is quite different from the Nietzschean will to power. A conversation of course has the ordinary dangers of every-day life which is full of ordinary conversations. That danger is the danger of making mistakes but need such a courage, because that is when we learn best, not when we write unimpeachable essays endowed with unassailable and precise “clear and distinct” ideas. I try to convey that sense of philosophy to my students on their very first day of an introduction to philosophy. Ideas perfect themselves in a dialogue. I got that sense in some of the classes in philosophy at St. Francis College which you Gerard were teaching there way back in the mid sixties. Namely that at the end of an arduous philosophical dialogue one may still not know what justice in a polis is really all about, but at the very least one knows what it is not. In this particular instance we may still not know exactly what debt forgiveness is all about but perhaps we know what it is not. It appears so far that it is not what the loaning bankers of the EU insist it is. So, let the conversation continue and my advise to all Ovi readers is that they not shy away from utilizing the Ovi comment section as much as possible. That kind of example has been given by the editor of the magazine Thanos Kalamidas who on this occasion, as in others, had decided to personally participate in the conversation on a topic close to his heart. I suggest that the insights that we may arrive at dialogically will hardly be reached solipsistically, in a closet, so to speak. So, let the conversation continue. For an in depth look at this issue of debt forgiveness open the above link to a New Yorker's article just out on August 3 titled "The Greek Warrior." I have been following these highly elucidative commentaries with great interest as they are illuminating to the point where I have nothing of value to add. But I love reading your work and felt I should let you know.